Reference : Nercessian - 363. Size : 20.2 x 21.6 mm. Weight : 3.17 grams. Grade : VF and while the surfaces of slightly rough, it is actually very nice for one of these. Obverse : Hetoum seated with crossed legs, on a wide bench, with an Armenian inscription that translates as "HETOUM KING OF THE ARMENIANS". 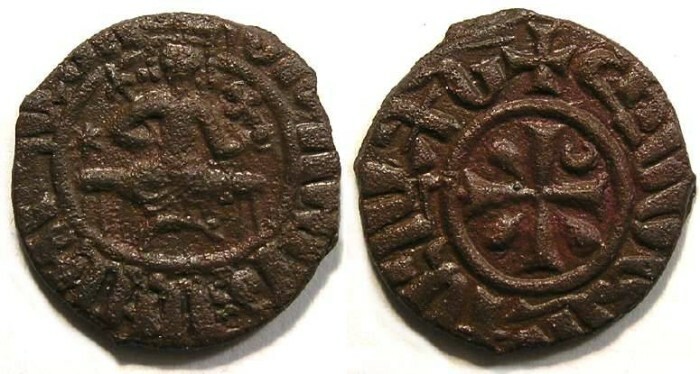 Reverse : Cross potent with a crescent moon in one quadrant and egg shaped lines in the others, with an Armenian inscription that translates as "STRUCK IN THE CITY OF SIS".